Too hot to cook? Here’s an easy solution! Keep ypur cool by making this delicously easy Fresh Coriander and Lime Chicken Salad. Created by TV personality, KWV brand ambassador and well-known chef, Mynhardt Joubert, it’s ideal paired with KWV Chenin Blanc. Quick and easy to prepare, it’s budget-friendly and uses seasonal ingredients. For extra flavour, Mynhardt suggests marinating the chicken a day in advance. 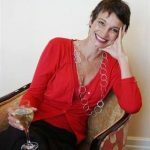 You can also make this recipe your own by adding extra seasonal fruit according to taste – lychees, raspberries, cherries and firm mango would work especially well. 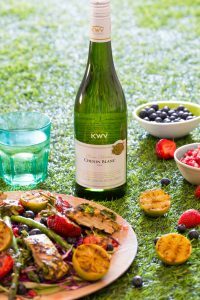 With its fresh, upfront palate and enduring finish, the modern-styled KWV Classic Chenin Blanc pairs really well with the fresh citrussy taste of the coriander and lime and served chilled, it’s an excellent partner for this dish. Mynhardt’s recipe serves 4 as main course, or double up for a bigger gathering. Mix all the ingredients for the chicken together and pour over the flattened chicken breasts. Marinate for about 10 minutes or overnight for extra flavour. Use a griddle pan or hot pan to cook the chicken breasts for about 3 to 4 minutes on each side till well cooked throughout. Leave to cool. Heat the leftover marinating juices in a sauce pan and bring to the boil. Cook for about 3 to 4 minutes until reduced and slightly syrupy. Remove from the heat and let cool. Pour over the cooked, cooled chicken. Blanch the asparagus: drop trimmed stems into boiling water for one minute, remove with slotted spoon and plunge immediately into a bowl of iced water. Pour off water in a strainer and pat asparagus dry with kitchen paper. Toss the cucumber strips and red cabbage together. Roast the limes cut side down and strawberries on the griddle pan until lightly charred. Arrange the cucumber and cabbage on an attractive serving platter with the asparagus, roasted strawberries and limes. Slice the chicken breasts and arrange on top of salad. Drizzle the reduced marinating liquid over the salad and garnish with blueberries and pomegranates. Serve with Chilled KWV Classic Collection Chenin Blanc and enjoy! Very reasonably priced at R46.95, the KWV Classic Chenin Blanc wine is available from liquor outlets nationwide.